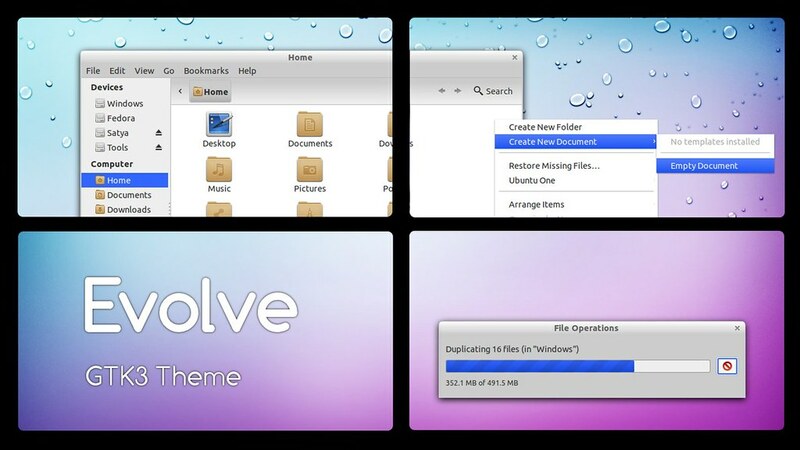 Evolve is a simple and minimal light theme for Gnome. The theme is compatible with the latest GTK 3.2 and uses the Adwaita engine. It also includes a GTK 2.0 theme suing Murrine engine. Extract the zip file. Then extract the tar.gz file to the themes directory i.e. "~/.themes/" or "/usr/share/themes/"
Now use Gnome Tweak Tool to switch both metacity and GTK Theme. If you are using Unity, then logout and relogin. gconftool-2 -s --type string /apps/metacity/general/theme "Evolve"
gsettings set org.gnome.desktop.interface gtk-theme "Evolve"